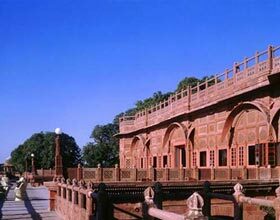 Address: Opposite Military Officer Quarters, Benayakiya Road, Shikargadh, Jodhpur, Rajasthan 342015 India. Indana Palace Hotel is a marvel located in the heart of Sun City, mirroring the yesteryear marvel architecture during the reign of the gallant Rajputs and culturally enriched Mughals. 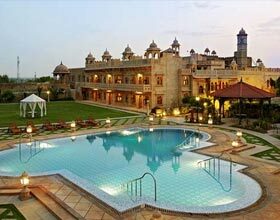 This sumptuous property is a pleasing episode of royal lodging, with its intricate inlay work, alluring jallis and jharokas, awe-inspiring glass partitioned bathrooms and comfortable kingly furnishings. Guests relish the splendid miniature paintings and exquisite vintage decors in the arched wooden panels during their stay in these lively rooms portraying the local folk culture. Facilitating lavish indoor and outdoor area segregated by array of banquets and lush green lawns, Indana Palace in an ideal destination for any magnificent event including themed weddings and gala product launches in Jodhpur. Onsite wellness center with spa facilities, swimming pool, Jacuzzi and many more are a delight for guests. 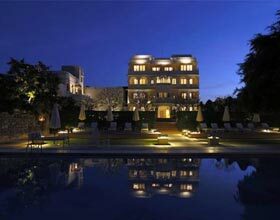 A quintessence of the vibrant era of the Rajput yore, elegantly designed 88 guestrooms of this new entre in the luxurious hotels of the Blue City are awe-inspiring. These sparkling accommodations with all modish amenities complimentary or surcharged are classified into Executive Rooms, Premium Rooms, Junior Suite Rooms, Suites and Presidential Suites. An enclave of luxury treats in the wilderness of the Thar Desert, Indana Palace Jodhpur offers scrumptious delicacies and eclectic beverages. Anghiti is a pleasingly designed all day dinner with mesmerizing interiors and gorgeous presentations of the lavish spreads. Infusing the continental and oriental savors with impeccable regional culinary skills, this restaurant serves delectable cuisines from regional and international fares. Lotus Cafe is a chic-styled lounge with fascinating lotus pictures ornate on wall, an ideal venue to snuggle in between the meals to nibble on the finger licking snacks and sip the refreshing espressos. I Bar, high ceilinged bar lounge with array of finest variety of brews served amidst the tranquil ambience drawn from miniatures and regal d�cor on the walls. Adore the exquisite Courtyard dining with delicious feasting buffets arranged in an alfresco venue on a fine weather day.